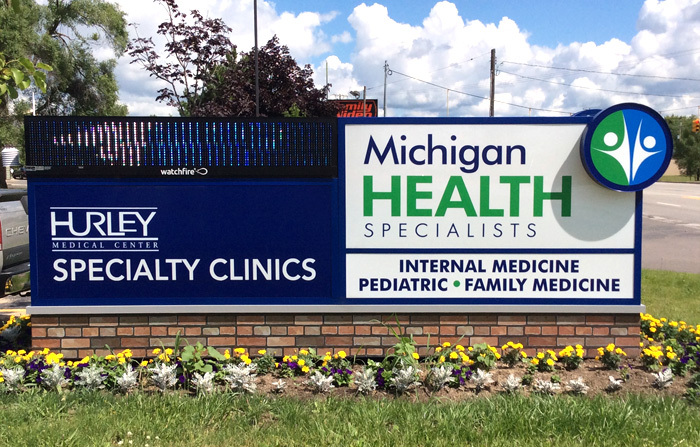 Michigan Health Specialists and Hurley Specialty Clinic chose Signs by Crannie to supply the signage for their new facility in Grand Blanc, Michigan. The project included a monument sign with an electronic message center, entrance and window awnings. Since they wanted an outdoor electronic message sign, SBC was the clear choice. We are the areas most experienced outdoor electronic sign installer and WatchFire LED Signs and Electronic Message Board dealer. Signs by Crannie also has factory trained service technicians to provide annual cleaning and maintenance to these high-tech devices. 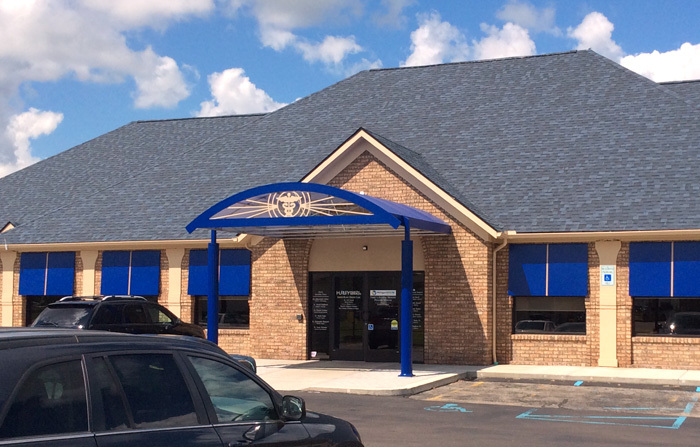 To cover the arched windows and give this re-purposed building a different look and feel, SBC also designed, manufactured and installed the custom entry canopy and window awnings. Outdoor electronic message signs and LED signs are the most effective, least expensive form of advertising for small businesses according to the Small Business Administration (SBA). A Watchfire LED sign gives you the ability to target a large, critical audience of potential customers already at your front door for far less than a traditional advertising campaign would cost. In a installation, an LED sign can cost as little as 74 cents per 1,000 impressions — compared to over $22 dollars for television and $13 dollars for radio for the same number of impressions. 8 in 10 consumers say they entered a store or business they had never visited before based simply on its signs. 3 out of 4 tell others about a business simply based on its signage. 2 out of 3 consumers believe that a business’ signage reflects the quality of its products or services. 2 out of 3 consumers say they purchased a product or service because a sign caught their eye.